A new plan from the British government will use closed-circuit television (CCTV) cameras at gas stations that will automatically prevent uninsured drivers from filling up their gas tanks—that is, until their vehicle information has been logged in the system. The Mirror reports that the plan is meant to address the 1.4 million uninsured motorists in Britain and act as a deterrent. That may not sound like a huge number compared with the estimated 13.8 percent of uninsured American motorists, but the 1.4 million figure represents four percent of all U.K. drivers. The British government decided to make use of the CCTV cameras after hearing a presentation from accounting firm Ernst & Young, which will help implement the new system. And while the proposal comes from the private sector but will be used by the government, it's hard to not immediately think of British author George Orwell's seminal novel "1984." "The key to this is simplicity. Connecting the existing technology ... is relatively inexpensive and wouldn't be a big information technology program" Ernst & Young partner Graeme Swan told the Telegraph. "There shouldn't be concerns about 'big brother' because there is no new database, no vehicles are tracked and no record is kept. It's simply a new rule of no insurance equals no fuel." The decision is already being met with complaints from gas station owners, who say the proposed law puts them in a compromising position. "Staff are already getting stick [flack] from motorists for high fuel prices," Brian Madderson, from RMI Petrol, told the Mirror. "This proposal will increase the potential for conflict. Our cashiers are not law enforcers." Several thousand CCTV cameras, which are currently being used to deter drivers from leaving the station without paying for their gas, have already been installed at stations around the country. So could British gas attendants start seeing a line of uninsured drivers with empty tanks filling up their station lanes? Not exactly. 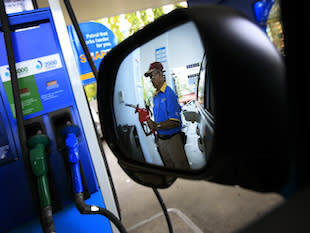 The Mirror notes that uninsured drivers will still be able to fuel up, but only after the camera has captured and logged their license plate numbers. And the inconvenience works both ways: Insured drivers will have to wait for their information to be verified before they are allowed to fuel up too. Which leads us to wonder, just how much of a deterrent to driving without insurance will this new system be?